Inspired by Spike Lee’s 1989 film Do The Right Thing. DJ Durel has given his latest single "Hot Summer" the visual treatment. 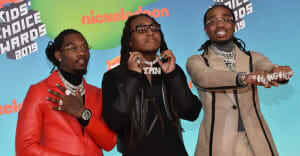 On Tuesday, Durel shared the music video for the track — which features the Migos. The clip takes inspiration from Spike Lee's 1989 film Do The Right Thing, which centers around a scorching hot summer in Brooklyn. Durel, Quavo, Offset, and Takeoff all dress up in colorful early '90s outfits, equipped with fanny packs and head bands as they enjoy a summertime block party. In August, Migos helped Drake kick off the North American leg of their Aubrey and the three Migos tour, which will continue on throughout the fall. Watch the "Hot Summer" video above.